Product families promote reuse of software artifacts such as architectures, designs and implementations. 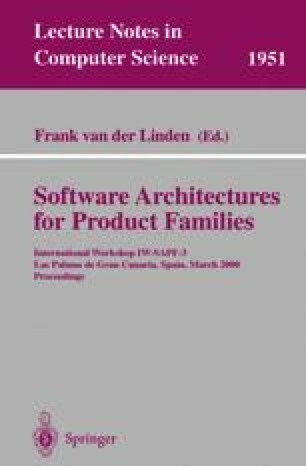 Product family architectures are difficult to create due to the need to support variations. Traditional approaches emphasize the identification and description of generic components, which makes it difficult to support variations among products. This paper presents an approach to modeling family architectures using generic software connectors that provide bounded ambiguity and support flexible product families. The paper also proposes an approach for transforming a family architecture to a product design through a four-way refinement and evolution process. This revised version was published online in December 2004. The book title of the original online version was incorrect.